Last summer we did a fun weekend thru-hike of Chugach State Park from Crow Pass to Glen Alps. One of the highlights was passing thru less traveled areas along the way. I've been looking forward to going back those places, and have been brainstorming ways to do it. 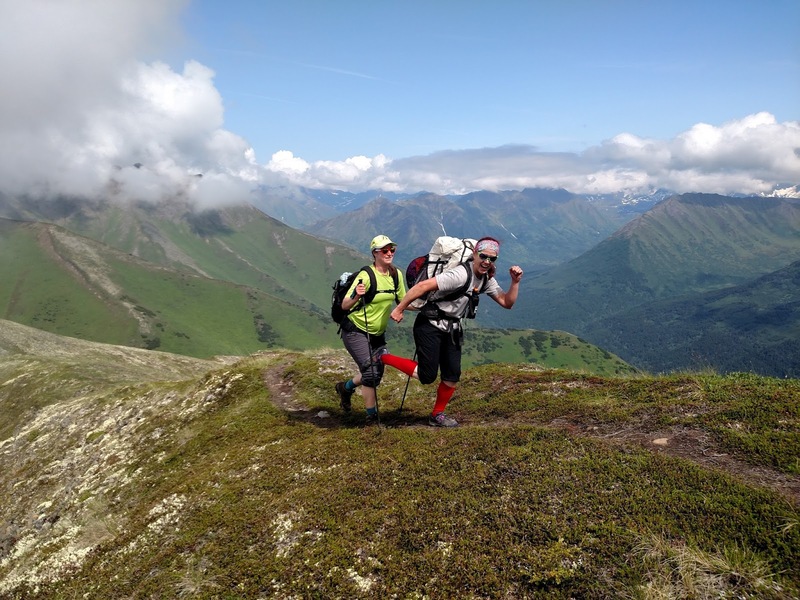 Arctic to Indian is a Chugach winter classic, but in summer is complicated by miles of bushwhacking and bogs. 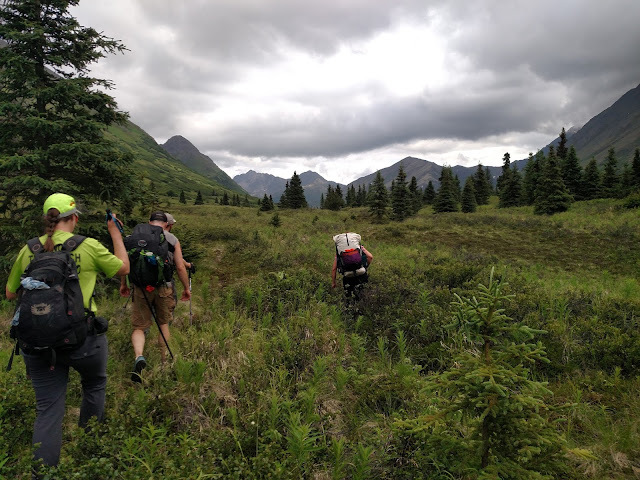 So, we settled on trying out a summer ridge-line version of Arctic to Indian following Rendezvous Ridge then connecting thru to Bird Ridge. This would pass thru some favorite places from last summer's thru-hike. After stashing our shuttle at Bird we started Saturday at Hiland Road. 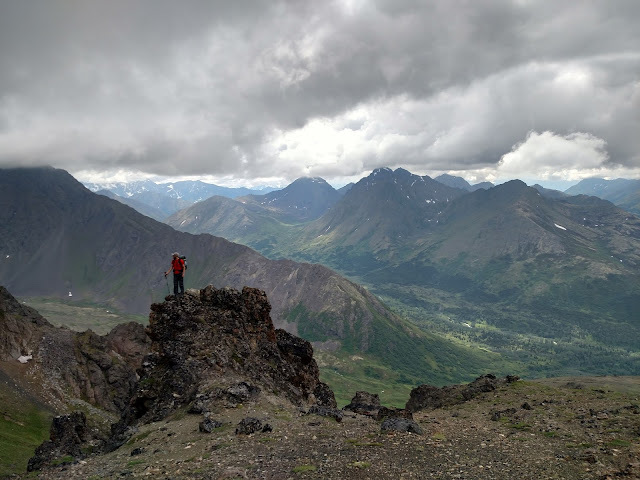 Shortly after Hunter Pass we climbed to the ridge. From there we could look south to the peak group that would take us to Bird Ridge. Along the ridge there were lots of fun high points to clamber over. Triangle with Calliope hiding in the clouds. Closer to Triangle the ridge sharpened into fun scrambling. Ance above the North Fork of Ship Creek we dropped south from the ridge. Easy scree brought us lower to connected meadows. Zack is calling these meadows "portals". At the valley floor we followed an amazing and continuous game trail east. Its fun to think about the countless generations of animals that have followed trails like this. Below the stream draining Bird's Eye Peak and the Wing we crossed Ship Creek. Zack is smiling because he's planning a weekend of dry feet. Once across Ship Creek, we watched a bear chasing dinner around the hillside, then linked meadows into the basin below Bird's Eye Peak. We didn't find any more animal highways, it wasn't long before we were back into lush alpine meadows. Reaching the basin directly under Bird's Eye Peak, we camped next to a beautiful little tarn. Mount Ewe is somewhere back in the clouds. As we ate breakfast Andrew passed by on his way from Crow Pass to Anchorage; it was a surprise to see other people in our tranquil little valley. Then we watched them climb the ridge above us. After packing up we followed Andrew up into the fog between Bird's Eye and the Wing. The fog flowed in and out as we followed sheep trails south to the Beak. 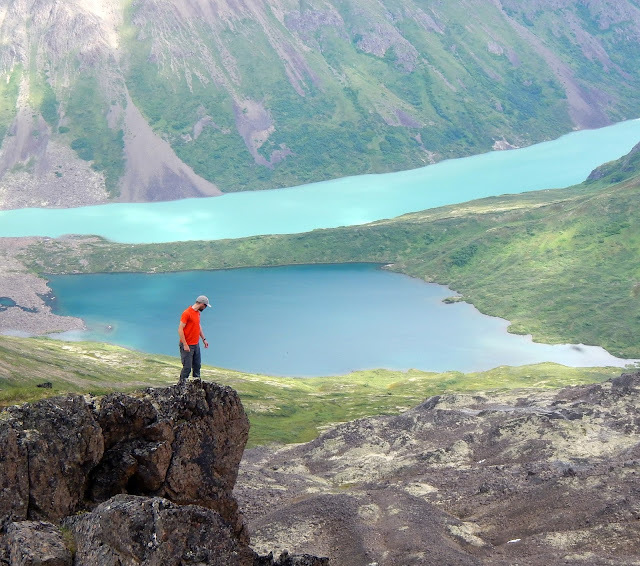 One of the highlights of the ridge between the Wing and the Beak was all the blue tarns below us. Another one under Bird Ridge Overlook. Under the summit cone of the Beak we dropped our packs and scrambled up. The rising fog added to the tickle of the airy perch. Finding a route through the fog and past the Beak was a bit tricky and quite exposed. In retrospect there would have been less cliff if we'd gone lower. But, its hard to know that when you can't see where you're going. Past and on towards Bird Ridge Overlook, the ridge became more reasonable. Climbing the ridge was a fun scramble thru large blocks draped in lichen. At the Overlook, the trail began to transition from one made from hooves to one made by people. Before long we were on our last descent, cruising down Bird Ridge to the car. This was a fun and moderate weekend that a lot of people would enjoy. It could be done in a day, but camping by that tarn was pretty special too.